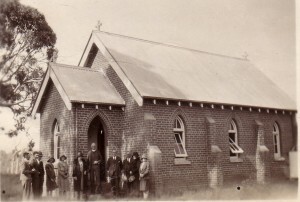 The foundation stone of Saint Nicholas Jeir, NSW was laid in November 1912, and the church dedicated in 1913. The church was made from local bricks. Saint Nicholas remained until some time after 1945, when lack of numbers forced closure and sale. Furnishings from this church can now be seen in Saint Clements and St Marys. It’s foundation stone has been incorporated in the walls of All Saints, Murrumbateman to the right of the main entrance.